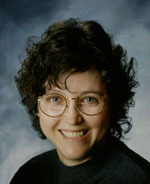 Cornelia Gamlem is an expert in employee relations and human resources. She is also a consultant, a speaker, and the founder/president of the management consulting firm The GEMS Group, Ltd. Working with colleague Barbara Mitchell, Cornelia has co-authored four business resource books. 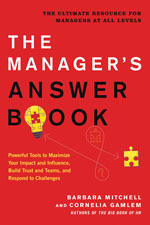 Their newest release is The Manager’s Answer Book: Powerful Tools to Build Trust and Teams, Maximize Your Impact and Influence, and Respond to Challenges (Red Wheel/Weiser, 2018). You’ll find Cornelia at BigBookofHR.com and EssentialWorkplaceConflictHandbook.com as well as on Facebook and LinkedIn. Follow her and Barbara’s weekly blog at MakingPeopleMatter.blogspot.com. Who did you write your newest book for, and what will they get out of reading it? The book was written for managers at all levels in organizations of all sizes and in all industries—this includes small business owners. Recognizing that while most managers have expertise in their own field, there are so many other areas and situations that they’ll encounter. New and seasoned managers can be overwhelmed by new situations, and those are the issues the book addresses. The concept for the book was proposed by our publisher, and my co-author and I thought it would be a fun book to write. The contract was signed in August 2017, the manuscript due on January 31, 2018, and publication scheduled for June 2018. From February through April 2018, we went through the editing process with the publisher, and received the galley proof in early April with two weeks to review and respond. Our publisher works on a pretty tight schedule and the challenge was coordinating our time with theirs. What makes this book unique in the business market? It goes beyond the people side of management and introduces the reader to getting started in their management role, developing skills, building credibility, working with other managers and functions, and avoiding areas of risk and conflict. Did you learn anything new from writing/publishing this book that you can apply to future projects? Each of the books I’ve written with my co-author has been published through a traditional publisher who provided a small level of publicity. We’ve learned traditional publicity is waning and we didn’t get as many requests for articles or radio interviews with this book. Social media and podcasts are clearly dominating the publicity space and the way to get your books noticed. We are focusing our efforts in that direction for all of our current and future books. What was the most rewarding aspect of putting this project together? Ironically, finishing it. During the writing process, both my co-author and I moved our homes. She moved seven miles and I moved 1,800 miles across the country. So there were lots of challenges and distractions along the way. What are some of the more interesting facts you discovered while doing research for The Manager’s Answer Book? Unlike the other books we wrote, this one drew from our collective experiences working in large organizations as employees and with smaller organizations as consultants. We saw many of the challenges managers faced and drew on our work with organizations and knowledge of organizational and management development to respond to these challenges. It was similar to writing an advice column for managers. Would The Manager’s Answer Book work outside of a business environment? People who work with volunteers or on volunteer boards would find certain sections helpful. “Developing Your Management (and leadership) Skills”—especially communication skills—is essential in these roles, as is “Creating Your Personal Brand”—your image, credibility, and effectiveness. Another section, “Managing Up, Down, and Around” talks about the importance of understanding the organization, as well as working with, and influencing others, to get things accomplished. Of all the books you’ve written, which one did you enjoy writing the most, and which was the most challenging? 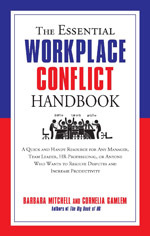 Writing The Essential Workplace Conflict Handbook, which was our second book, was enjoyable because we incorporated scenarios to describe the situations we were discussing. It was a different approach from our first book. The follow-up to that book, The Conflict Resolution Phrase Book, was probably the most fun—coming up with things to say and not say in a conflict situation. The most challenging was the second edition of The Big Book of HR. It involved a great deal of revision which required moving text and footnotes around. We had to be focused and take extra care explaining all the changes to our virtual assistant and editors. Writing a book is like having your own business—you have to constantly and continually promote it. You’ve got to have a marketing plan even if you are working with a traditional publisher. Having had my own consulting practice, much of the promotion came painlessly. Connecting with other writers, especially those who write in the same genre and learning what they are doing, came as naturally as networking. The challenging, but rewarding, part was learning about the publishing industry, public relations, and about social media and related technology. Do you prefer the creating or editing aspect of writing? How do you feel about research? Definitely creating. I leave the editing to the experts, plus it’s so hard to see your own mistakes. In your head, you know what it’s supposed to say. The research I’ve done for my books has been painless since I’ve written about subjects that I’m very familiar with in areas where I’ve worked. When it came to doing research, I knew where to find the most relevant information. Do you write other than nonfiction or have you ever wanted to? Funny you should ask that. An idea for a book took hold when we finished our first book. When we wrote our second book together, my co-author and I wanted to integrate more scenarios to illustrate lessons, and a whole new storytelling voice emerged. We’re now working on a book that’s creative non-fiction. It’s a series of stories based on actual situations that have occurred in organizations. In addition to the creative non-fiction book, my writing partner and I write a weekly blog called Making People Matter.